Great card & a lovely background. Love Pansies. This is a gorgeous. Another great die and card, the pansy tones in well with the background. Thank you so much this is a very pretty card,and die set. Thank you Sue this has been a wonderful launch. Thank you for all your hard work, and great inspiration. Hi Sue, and you finish with another of my favourite flowers. The Pansy Flower Square is as pretty as the others and I think with a bit of luck all my Easter cards will be made this year using these lovely dies and the daffodil. It is we who should be thanking you for all your hard work and the willingness to share your creativity with us so - Thank You! A really lovely die to end on. Congratulations on another brilliant launch of some truly amazing dies. There are lots of favourites amongst them! Hi Sue, I totally agree - this design absolutely sings to me too. These flower squares are such good value as they suit all age-groups. I have used your original pansy flower dies a lot, so definitely plan to add this new die to my collection. Another absolutely stunning card Sue. Thank you for this blog run and all the hard work you put in. Awesome! What a great finish! Brilliant launch, like the pansy but I think my favourite is the tulip. Love this one too, beautiful colours. Really don't know my favourite square flower dies, I love them all. Great end to your dies launch. Beautiful card showcasing another lovely die. So many new dies in this launch to add to my wish list! Definitely my fave flower die. Hi Sue, beautiful pansy die. Lovely little flower and the card is also lovely. Thank you Sue for sharing this die release with us. You never cease to amaze me with your inspiration. This release has been absolutely wonderful as has your cards showing them off. Once again thank you very much. A beautiful die and card to finish with,and a stunning die release, thank you. I love dies that make a frame and picture - thank you Sue. Afternoon Sue and all Wilsonettes, what a way to finish this latest launch, fantastic dies and the samples are truly brilliant, thank you Sue. A lovely card and fabulous flower square die. Hi Sue. That's a really nice pansy and I love the way it looks as though it is peering at you through a window. Hi Sue, a gorgeous card and die. Your Pansy square die is beautiful. Thank you for showing us your latest die release and giving us the chance to win one. There are so many on my 'I want list'. Such a beautiful card and die set to end this wonderful release. Thank you Sue for all your hard work and sharing it with us. Stunning Sue. Pansies are one of my sisters favourite flowers so I think I will be using this die for her next birthday card. Love it and have loved the launch. Thank you. So beautiful! I love pansies! Great new dies! I've loved all the dies in this release. The pansy completes the collection beautifully. A delightful finish to the launch. So many dies that I have to have just wish I had more money . Sorry to know this is the very last post for the launch. It has been amazing - so many gorgeous dies. Thanks a lot, Sue, for another great collection of dies! And your last post is another stunner. It's fabulous. I love this card and die set - pansies are one of my favourite flowers so I would love a chance to win this fabulous die! With the different techniques I can use with this .I will love playing with the stained glass effects. Very pretty card, really love the pansy die! I really have enjoyed your launch Sue, amazing dies and thank you for all that you do. It looks like anotherwinner for my stash. Thank you for being so talented. Great finish to the day. Lovely pansy die and final card. Can't wait to see you on tv when you demo these latest dies. I have a friend who would love a card made with this die, Sue. ....Another one I adore!.... Pansies are such a sweet flower!! Another beauty Sue, love it! Hi Sue Oh glorious pansy! They are such cheerful colourful flowers This is a wonderful die to end your launch with This launch has been truly amazing I love all the new dies &wish I could have them all it will be difficult to decide which to buy Thank you so much Sue your designs are the best! Hi Sue, Beautiful !! another beautiful card and this pansy die is so pretty. Thank you for all your samples, I am really looking forward to watching you create some of these gorgeous cards. Your new collection has been beautiful, each post has been like an episode in a tv drama, I have been waiting impatiently for the next and next episodes. I think this is my favorite of the flowers. Love the colors on the card. Can't wait to see some videos with all the flowers. Love this post and think it edges it from the tulip as my favourite of the new flowers. Beautiful colour combo as well so all round has a bit of a wow factor for me. I love pansies as they are so bright and cheery and so many colour combinations. Well a lovely end to yet another brilliant launch. I love blue & I love flowers so this card is bound to hit the spot. When your new Dies first started to appear I spotted the tripple column background & that immediately went to the top of the list. (Think it might be one of your favourites as you have used it a few times!). It is still there, but only just as the list has grown so much over the last few days. Thank you so much Sue for all your hard work & inspiration. Another lovely die, love how each one has been done differently within its square by either leaving or removing the outer parts. Thank you for a superb launch, for your inspiration and for your generosity. Ending with another lovely card. Thank you, Sue, for all the posts this week. I have really enjoyed them all, and if I'm one of the lucky ones to win one, any of them would be a great addition to my stash. I do have some favourites, and my bank balance will be taking a hit next week ! Hi Sue, this Pansy Flower Square will fit on an A2 card! I think the pansy is one of the happiest flowers. I always smile when I see one. Well this a stunning card which makes for a fabulous finale. The colours you have used are beautiful - such vibrant shades of blue. This has been the most incredible launch. Such an eclectic mix of dies and I love them all. There are no favourites because they are all so wonderfully different. The new layering dies are something else, the mermaid is stunning and the frames and tags as ever are ingenious. I can’t tell you how much all your hard work is appreciated Sue. The dies you design so brilliantly and the time and effort you put into making all those cards which really are in a league of their own. Thank you so much for sharing your unbelievable talent with us Sue. Love your card. I'm not a great fan of the stained glass look but I love the pansy. Awww.... I love Pansies and this square die looks delightful! Awesome card with it! All your dies have been amazing, I don't think there is one I don't like. Hello Sue, what a stunning die this pansy is and again the colours are just amazing. Very pretty, Sue. Another one of my favorites. Love this die. Hope to get next month. I have purchased so many this month, I can't kept up. Love all the new dies by Sue. Beautiful card. Love the vibrant blue used. Oh I love this. Such a cute flower. A great way to end a fantastic release! A beautiful card Sue. These Square Flower Dies are so pretty and so useable. Suit any occasion. This has been yet another fabulous collection of dies, for which we thank you. So many favourites. Another lovely die. What a lot of effort from you. Thank you. - loads of dies I’d love to have. Love everything about this card from the pixie powder and plastic wrap background (has turned in to one of my favourite techniques) to the gorgeous pansy which was my sisters favourite flower so brings beautiful memories for me. The flower frame dies are so versatile as they can be used on their own on smaller cards as well as in multiples for larger ones. Love the pansy die! Congratulations Sue on another successful collection! WOW what a stunning card to finish the end of your new collection of dies. The pansy flower is so beautiful with the colours from the pixie powders really pops when it has been paper pieced . May I just say what a fantastic new collection of dies for the launch and each sample has been stunning. You have worked so hard and its been a pleasure to have a peep each day. Wow what a beautiful die and card to end this launch! I love the vibrant colours you’ve used! What a wonderful die and card to end the launch. Pansies were my dear Hubbies favourite flowers and in the early stages of his dementia he would buy me cards with purple pansies regardless of whether they were for birthdays or Easter or any other occasions. Thank you so much I am going to buy this die and make myself a purple Pansy card. I do hope you are giving yourself a rest day. this is glorious Sue and I love the colours you have used. I adore pansies. Hi Sue - this die is just gorgeous. Love it. Everyone loves flowers and I especially love the pansy, the colourways on the card are great too! Gorgeous card,I have really enjoyed all of your work. You've definitely ended this release with a beauty. Thank you for the ideas, new dies and inspiration! This has been another fabulous die launch. So many wonderful dies. Including this one. This die is so beautiful and I love the way you inlaid the colored areas! WOW What a magnificent card and die to finish a fantastic launch with. What a gorgeous card to finish you die release with. I love the background you have created for it and it shows off the beautiful pansies wonderfully. Sue you are such an inspiration to so many card makers and so generous giving dies away on you blog. I haven’t been able to comment on your blog a lot recently as I’ve had a lot on but I love your dies and try and catch up on the posts I’ve missed when I can. I’ve not been able to be with you every blog post for this release but must say this die release is amazing. Love these flower dies, all of them are beautiful especially pansies. Here we are, enjoying the last post of this great launch and indeed we have what to enjoy, another beautiful flower square used to create another lovely sample. Each release had new designs but this time thru the triple layering dies you raised the standards. The lines of your new die sets are delicate and beautiful, you paid attention to the smallest detail creating not a die set, but a poem that inspires us each and every time we look or touch these amazing creations. And for all the above, all I can say is Thank you. Another pretty die I need for my collection. Such a pretty card and I love the big bold colors that you used against the white die cut. Gorgeous card in these vibrant rich colors! 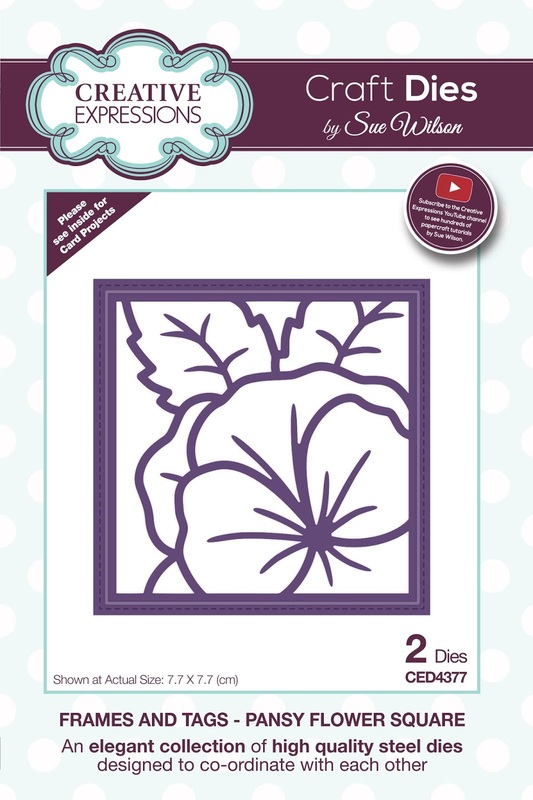 Love the way youve designed all of these squared flower dies! Pansies are always a pleasure as they will bloom most of the winter here when everything else is drab. Cute die and a lovely card. must have die for me. Beautiful card. Love the Die. This was a wonderful release. Loved all the Dies!